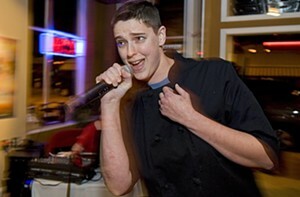 Carly Herring of Shockoe Bottom spot C’est le Vin, shown above, can be found singing (err, rapping Eminem) in-between slinging tapas on Thursday nights. She takes requests for both food and songs. Occasionally, Jason Alley moves from the kitchen to the dining room in downtown’s Pasture to belt out a tune. His rendition of Johnny and June Carter Cash’s “Jackson” isn’t better than his food. Aaron Hoskins, a freelancing chef, thinks he’s the lead singer of Bon Iver when he isn’t cooking. Really. Ask him.